It is 69AD, Nero, the last of the Julio-Claudian Roman Emperors, is dead. Especially in the latter years of his regime he acted as a true despot, even ordering the murder of his wife Octavia to be able to marry Poppaea Sabina. When Rome was burning in 64AD he accused the Jews and the Christian Population with the crime, and subsequently started persecuting these innocent people. Historically, four Roman generals vied for the throne following Nero's death. Galba, Otho, Vitellius and Vespasian each became Caesar within the space of one year, only to lose their position as quickly as they had gained it. In Nero: Legacy of a Despot, you are a contender for Imperial power. Using your legions and political influence, your aim is to either seize and hold the Imperium by being declared Emperor, or to gather enough land and power so that, at game's end, you are in position to do so. 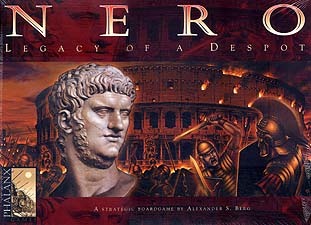 Nero: Legacy of a Despot is an exciting strategic boardgame full of opportunities. The overall strategy is to become Emperor, stay Emperor, grab areas, and amass victory points. However, to do that, rather than take an extended overview and plan way ahead, the game requires players, instead, to react and act quickly, often making their own opportunities by playing the event cards sagaciously and timely. Event cards include Assassins, Briberies, Bad Auguries, German Tribe Attacks, Galley Fleets, Crisis in Roma, the Praetorian Guard and many more! The game does not contain any dice - movement, combat and events are all covered by the deck of playing cards.